linen | Sophisticated Diva ~ A.K.A. Along came Polly! Announcing the wonderful Mother’s day sale on all Prima bundles! 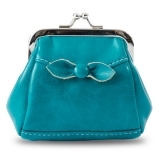 This sale is so hot–that the only way you can get the full details is to email me at sdhmhandbags@aol.com and ask for the prices (honest–we aren’t allowed to publicly post prices on social networking sites and blogs~my apologies, but only email subscribers get information on pricing and sales!) I love to share the news with all my subscribers–and to top it all off, once in a while-you’ll find a special bonus from me in these emails! So let’s cut the guesswork, and get you informed 🙂 Here’s the insider link! Contact me now at sdhmhandbags@aol.com or just head on over to my WEBSITE and add a prima base, with ANY TWO SHELLS, including the new releases and THE URBAN SHELLS LAURIE AND CHELSEA (BUT HURRY, LAURIE IS LIMITED QTY) —and head to checkout—you’ll be AMAZED at the discount that is taken from your shopping cart!! Mother’s day is coming—so there’s no harm in forwarding these special emails to your children or your mate! (With a special wish list of course!) Don’t miss out on this special deal! 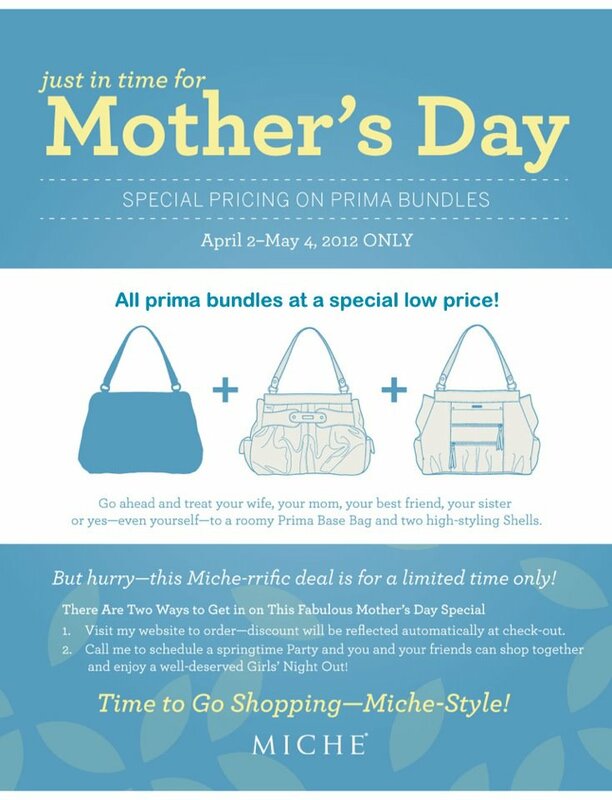 New April Miche shells, wallets, coin purses, cross body hipbags, released April 1st! Welcome April 2012 Miche bag new releases~coin purses too!! Good evening~These items will be available for purchase tomorrow April 1st!! If you don’t see them on the website, feel free to give me a call and I’ll assist you with placing your order! I can be reached at 815-721-5549 all day for your convenience! 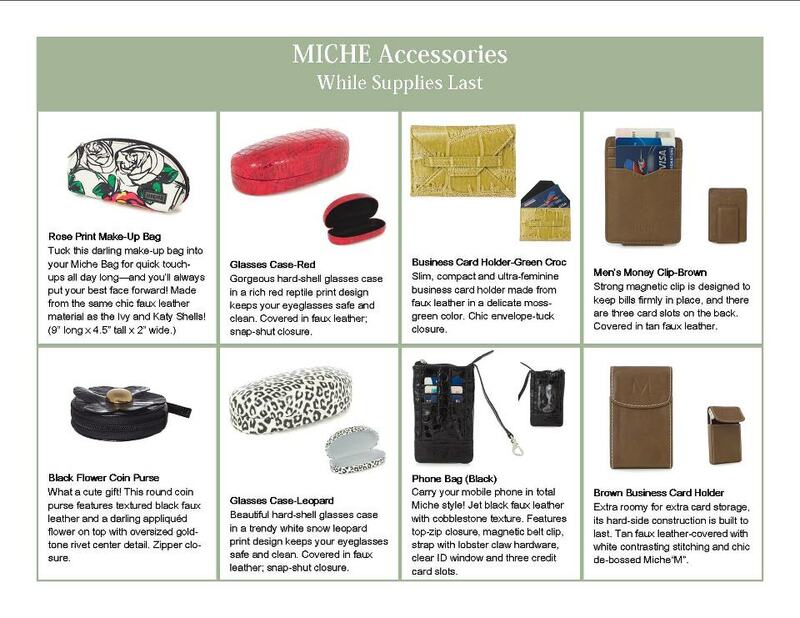 Here are the new beautiful Miche shells for April, along with the new soft wallets! These wallets are buttery soft in colors to match popular Miche shells–or accent – but should you want the Beverly demi shell, or the Summer demi shell to match these beauties, don’t delay, as supplies are very limited! Margo, Skylar, and Lola coin purses make quite a fashion statement for spring, don’t you think? Also new are the two HIPSTER BAGS—-These make the 4th release of the hipster! More to come in the future, these popular bags do not have interchangeable shells, but make a fabulous fashion statement ~ use your while out running around, quick trips to the store, or vacationing! I use mine for my camera-and carry it alongside my Miche bag! Great with a jeans and Tee! The black rope handles will also release in April, however we are still waiting for the silver rope handles, and the white link handles to return to stock—THESE WILL BE LIMITED! I can’t stress this enough, as in previous weeks, the handles and accessories have sold out quickly ( the silver rope handles lasted 48 hours!) Please grab a set as soon as you can, and remember to tell your best friend–or just grab a set for her too! It’s upsetting when a customer is left unhappy because she didn’t get something she really wants—–and when they are gone, chances are good that I have no “hidden resource”. I really do try to provide the best for my customers! Feel free to share this blog with a friend—-and as always, if you’d like to arrange an online or in-person show, and earn hostess credits and half price shells—-I’m no further away than a click of a mouse, or a phone call! This entry was posted on March 25, 2012, in accessories, business, business opportunities, buy online, designer handbags, Diaper bag, fashion, for the love of scarves, gifts, handbags, home based business, home business, home shopping, illinois, jewelry, legitimate work from home busisness, listings, messenger bag, miche bag consultant, miche bag party, miche bag representative, miche bag shells, miche bags, Miche representatives, new miche bag, purses and tagged 2012, accessories, alaska, albequerque, alexandria, appleton, april, april 2012, april 2012 miche bag shells, area orlando, arizona, arkansas, arlington, aurora, bags, baytown, Bellevue, bellvie, beloit, belvidere, best business, best handbag, beverly, big bag, black rope handles, boone, brookfield, business card holder, business women, buy online, california, capron, carolina, cases, ccompensation plan, cecelia, cecilia, cedarburg, chelles, cherry vale, cherry valley, cherryvale, chicago, christa, christian, classic, clearfield, clothing, coin purse, coin purses, cole, colorado, colorado springs colorado, compensation plan, cosmetic bag, county fair, cover, covers, cross body hip bag, dakota, dallas, delafield, demi, des moines, designer handbags, Diaper bag, elgin, elm grove, estates, everett, farrah, fashion, fashion bags, february, federal way, flint, florida, freeport, georgia, girls, glen ellyn, glencoe, green, handbags, handles, harlow, harlowe, harper, harvard, hip bag, hipster, home based business, home business, home shopping, home show, hope, hope purple, Hope–and more! Sophisticated Diva accessories, houston, how much does a Miche rep make, how to become a miche bag representative, how to become a miche rep, how to work from home, ia, idaho, illinois, indiana, indianapolis, Iowa, irving, ivy, jackson, jayla, katy, kenilworth, kent, kentucky, kewauskum, krikland, la crosse, lacrosse, lake, lake forest, lakes, laurie, legitimate work at home business, legitimate work from home busisness, leopard, lily, limited, linen, lola, looking for representatives, los angeles, louisiana, madison, maine, makeup bag, mall, march, march 2012 miche bag shells, march 2012 miche releases, margaret, margo, marietta, martha, marysville, massachussetts. Ma, matching, mchenry, medium bag, meechee, meeshee, megan, mequon, messenger bag, miche, miche bag, miche bag cell phone holder, miche bag consultant, miche bag party, miche bag rep, miche bag representative, miche bag shells, miche bags, miche beverly shell, miche business card holders, miche cell phone bag, miche coin purses, miche eyeglass case, miche glasses case, miche hip bag, miche ivy makeup bag, miche katy makeup bag, miche makeup bag, miche makeup bag to match, miche march shells, miche mens business card holder, miche mens money clip, miche mens products, miche money clip, miche pewter rope handles, miche phone bag, miche phone case, Miche representatives, miche rose makeup bag, miche website, michee, michi, michie, michigan, mikwaukee, mini bag, mishee bag, mishi, mississippi, missouri, mom in business, money clip, monroe, neutral wallet, nevada, new, new march miche shells, new mexico, new miche accessories, new miche april releases, new miche bag, new miche beverly, new york, nicole, nina, northbrook, not designer inspired, not knockoff, nurse, ogden utah, oklahoma, oregon, orlando florida, outfits, oviedo, pennsylvania, peoria, petite, pewter, pewter rope handles, pheonix, phoenix, phone bag, phone case, photographer, photos, pictures, pink, plano, poplar grove, port st charlotte, port st lucie, portland, preview, prima, purple, purse, purses, quantity, raleigh north carolina, red, riley, rockford, rockford illinois small business, rockford local business, rockford women in small business, rope handles, sandy springs, schaumburg, seattle, shell, shells, shoes, silver, silver rope handles, skylar, sleeves, slips, snake, snakeskin, sneak peek, sneak peek april miche bag shells, sneek peek, spring, springfield, springs, st louis, stephenson, style, sugar land, summer, tacoma, tampa, tennessee, texas, the best handbags for, thiensville, top, top companies, top miche bag, top purses, top rep, updates, urban bag, urban bag alexandria, utah, vancouver, vendor event, virginia, wales, wallets, washington, waukegan, waukesha, west bend, what does a miche bag rep made, where to buy the miche bag in rockford, white linked handles, wi, windmere, winnebago, winnetka, wisconsin, women, worcester, wraps, yakima, yellow, yellow More stats 0 3 2012/03/18 Published Miche shells limited quantity alert! Martha, yellow wallet. Here are the new beautiful Miche shells for April, along with the new soft wallets! These wallets are buttery soft in colors to match popular Miche shells–or accent 🙂 – but should you want the Beverly demi shell, or the Summer demi shell to match these beauties, don’t delay, as supplies are very limited! Miche Demi Beverly shell is BACK IN STOCK! Just a quick note—the Miche Demi size Beverly shell is back in stock~ One of the most sought after shells this season, it’s been difficult to keep this one in stock—if you have an urgent need for the Beverly shell–or one of the other low quantity alert shells for the Demi such as Summer and Cecelia, it’s in your best interest to order now! Other shells “at risk” are Cecelia, Summer which can be found in this link DEMI MICHE SHELLS and LAURIE for the Prima base. Don’t miss out! Hope Purple in all sizes are out of stock-and retired. The white link handles and silver or “pewter” rope handles are scheduled to be released later this month so please don’t forget to check back—or subscribe via email to this blog-I will update as new products become available! Beverly Miche bag shell (for demi base) is back in stock! I have great news for those who have been patiently (or maybe not so patiently)! The Beverly Demi Miche shell is back in stock and available on my website HERE now! This beauty is a February Miche release, and has been in high demand—-and I can see why! Her big sister Farrah is a March release and is currently available on my website as well. blanched almond color and her stylish rushing detailing along the sides, snakeskin pattern faux leather. Miche new accessories~March 2012 Miche shells now available! Just released! New accessories to add to your Miche collection! The Business card holder–will compliment any of your shells, but will be especially complimentary to the Parker prima shell! 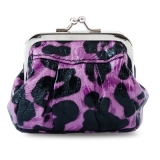 The rose print makeup bag—-this one is sure to please with spring and summer oriented colors! I can see this accessorizing any white or cream shell, a black shell, yellow–reds, but it matches the Ivy and Katy shell beautifully! The black flower coin purse! This again, is a neutral color that matches anything in the Miche collection~with a zipper closure so you don’t lose those precious pennies. 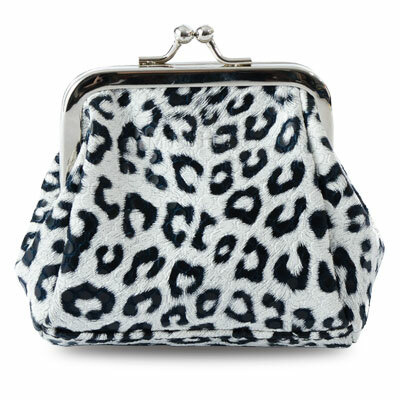 Eyeglass cases in two styles, red–or snow leopard print—and a snap closure! You invest good money in a pair of eyeglasses–protect them with these stylish eyeglass cases. And finally–two men’s products! We offer the Men’s money clip or business card holder, both in brown~ now when you place that order, you can pick up something for him!As previously said, these accessories are hot!! Get them now while there’s a good supply! I don’t want anyone to miss out, and I have a feeling they’ll not last for long!